Eritrea is a country located in the horn of Africa. It shares its borders with Sudan to the west, Ethiopia to the south, Djibouti to the south-east and Red Sea to the east and north-east. Located along the Red Sea in the Horn of Africa in Eastern Africa, Eritrea is a small multi-ethnic nation that was once part of the ancient land of Punt. The territory of Punt, which is mentioned in Egyptian texts dating back to the 25th century BC, included modern-day Eritrea and surrounding nations. Eritrea's location on the Red Sea made it an important place for exploration and trade, as well as invasions. Eritrea was part of several kingdoms over its early history. Around the 8th century BC, a kingdom called D'mt ruled the region until the 5th century BC. In the 1st century BC, the region was ruled by the Aksum kingdom, which also included Ethiopia and lasted for centuries. Various outside forces controlled Eritrea in its history, including the Ottomans, Egyptians, Portuguese and British. Italian settlers arrived in the late 1800s, and made Eritrea an Italian colony in 1890. The colony became Italian East Africa along with Ethiopia and Italian Somaliland. The country's name was given by the Italians, and is the Italian version of the Greek word for "red land". The Italians remained in control of Eritrea for decades, until the British took over after World War II and then Eritrea became part of Ethiopia in the 1950s. For 30 years, Eritrea fought to become a sovereign nation. Eritrea finally declared independence in 1991 and was recognized by the international community after a UN-supervised referendum in 1993. There has been continued conflict between Eritrea and Ethiopia, with some of the borders between the two nations in dispute. Eritrea shares borders with Djibouti, Sudan, and Ethiopia, and has coastline along the Red Sea. Across the Red Sea from Eritrea are Saudi Arabia and Yemen. Eritrea features miles of coastline along the Red Sea and the Bab-el-Mandeb (Mandeb Strait), and recently announced plans to make it the first country to ever declare its entire coastline an environmentally protected zone. This also includes many small islands off the coast and the coral reefs. Eritrea's coastline is considered a coastal desert, with arid beaches and grasslands. The fertile lands of Eritrea are found in the western hills and the highlands. Eritrea's highest point is at Emba Soira in the centrally located Eritrean Highlands, which has an elevation of 3,018 meters (9,902 feet). Eritrea does not have rivers that flow all year round. After the annual seasonal rains the rain-fed rivers Anseba and Barka flow north, and the Tekeze and Gash rivers flow westward towards Sudan. Part of the Gash River is also known as the Mereb and defines a section of the boundary between Ethiopia and Eritrea. Eritrea's capital is a major stop for visitors to the country, with Asmara's interesting architectural style that gives the feel of time travel back to the early 20th century. Art Deco buildings and clean landscaping make this well preserved city a great destination. Asmara, like many cities in Eritrea, displays its colonial history by the Italian influence that remains. The city also has an open-air museum, the Cathedral of Asmara, with its Romanesque architecture, places of worship, and the Asmara Theater and Opera House. One of the main attractions in Asmara is the Fiat Tagliero, a futuristic service station designed to look like an airplane. A visit to Massawa is also recommended, though the old city's remains have been largely destroyed, they provide a look back into the colonial history of Eritrea. Those seeking more of Eritrea's natural beauty can head to the preserved beaches and some 300 islands, or climb to the top of Emba Soira. It's possible to drive up much of the mountain, but the final summit must be hiked. In the Eritrean Highlands, visit the traditional village of Tselot. Martyrs National Park offers preserved forests in the highlands. 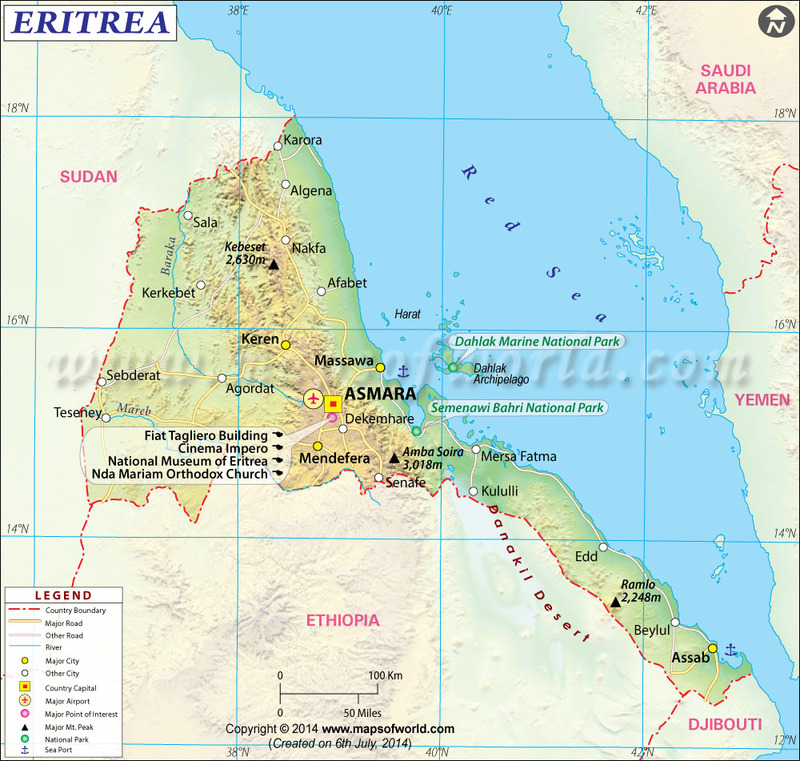 The two international airports of Eritrea are Asmara International and Massawa International. It is possible to drive into Eritrea, but those who do must own the car they are driving, as rentals are not allowed. Buses and boats, however, are available to transport visitors into Eritrea. Bus and minibus are the most common way to get between the towns, and there is a railway to travel between Asmara and Massawa, mainly used for tour groups. Traveling with a tour group is a recommended way to experience Eritrea, as there are some militarized zones and other challenges for visitors. The flag of the State of Eritrea comprises two triangles in green and blue with a red triangle pointing away from the hoist side. In the center of the red triangle is a yellow wreath with fourteen leaves on either side.